Archaeologists agree that dogs were the first animals domesticated by humans, before even cattle, goats, or horses. Cave drawings from the Paleolithic era, 50,000 years ago, show men and dogs hunting together. Dogs also gave warning of trespassers or enemies. Over time, humans found additional uses for dogs: herding domesticated livestock, pulling travois, wagons, or sleds, and carrying burdens. The earliest known ancestors of the American Pit Bull Terrier served as guards and draft animals, but they were especially esteemed as dogs of war. The ancient Greeks had huge, ferocious dogs of a type called Mollossian, which historians believe originated in Asia. During the sixth century B.C., Phoenician traders brought some of these Greek guard dogs to Britain. There they flourished and became the ancestors of Britain's early Mastiff-type dogs. When the Roman Legions invaded Britain, they were met on the beaches by the Britons' fierce Mastiff-type war dogs, fighting side by side with their owners. The Romans admired these fighting dogs so much that they sent many of them home to Italy. There the dogs were called Pugnaces, which means "broad-mouthed dogs of Britain." As the Roman legions spread across Europe, so did the dogs. Today's APBTs are descended from ancient Bulldogs and Mastiffs-—both tenacious, fearless breeds. During ancient times, there were no dog breeds as we know them today and dogs were usually named for the work they did. For example, in Britain all guard dogs of massive size were considered Mastiffs, and all dogs quick, brave and small enough to enter a hole in the ground (terra is the Latin word for earth) after wild game, such as badgers or foxes, were called Terriers. Eventually, some of the Mastiff-type dogs became specialists. A 1632 dictionary defined the Alaunt as a Mastiff-like dog used by British butchers to round up and pen fierce oxen. The Bandog was any large guard dog who was kept chained during the day. And the Bulldog, of course, was the gladiator. 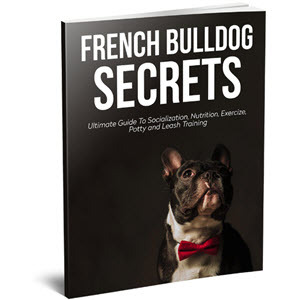 George R. Jesse, the famed British canine historian, wrote that the Bulldog was the result of selectively breeding Mastiffs to produce a smaller, more agile dog with a recessed nose and a protruding jaw. This, Jesse contended, would enable the dog to breathe freely while holding onto a bull. Blood sports (primarily pitting dogs against bulls or bears, although other animals were often also involved) were very much a part of daily life in ancient Britain and were not just entertainment for the working classes. In fact, kings and queens often mandated that contests be arranged. When French ambassadors visited the court of Queen Elizabeth in 1559, the queen entertained them with a fine dinner followed by an exhibition of dogs baiting bulls and bears. Britain passed the Humane Acts in 1835, making blood sports illegal. Although dogfighting was popular before then, it was often just one part of a full day of blood sports, a kind of warm-up before the main event. But interest in dogfighting grew rapidly after blood sports were abolished because, unlike bullbaiting rings, dogfighting pits did not require much space. Contests could be secretly held in cellars and the back rooms of pubs. This painting by Benjamin Marshall shows Dustman, a Bull-and-Terrier dog. During the early 1800s, some Bulldog breeders tried something new, hoping to breed faster, fiercer fighters. 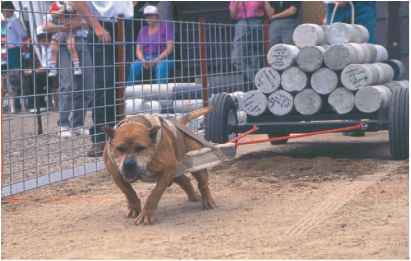 They bred the most formidable baiting and fighting Bulldogs with the toughest, quickest, and bravest terriers. This cross was believed to enhance the fighting ability of the Bulldog by reducing her size while maintaining her strength and increasing her speed and agility. Although some historians say the smooth-coated Black-and-Tan and the White English Terrier (now extinct) were most frequently crossed with Bulldogs, others say the Terriers were chosen only on the basis of gameness and working ability, and that a variety of Terrierlike dogs were used. The result of these crosses was called the Bull-and-Terrier or the Half-and-Half. As time passed and Bull-and-Terriers were selectively bred, they became recognizable as an emerging breed. 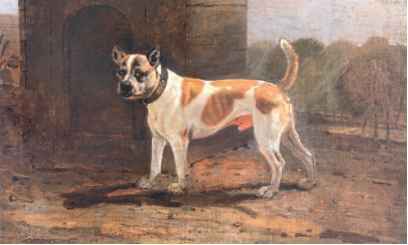 An early Bull-and-Terrier named Trusty was so famous in Britain that an article and picture of him appeared in an 1806 edition of The Sporting Magazine. The picture is the first known one of a Bull-and-Terrier cross. Trusty was "as renowned for his battles as [Napoleon] Bonaparte," according to the article, and "fought 104 battles and was never beat." Raised by a prizefighter and later owned by a succession of boxers, Trusty was eventually purchased by Lord Camelford and came to be known as Lord Camelford's dog. Later Camelford changed the dog's name to Belcher and presented him to Jim Belcher, boxing champion of England. Camelford explained that "the only unconquered man was the only fit master for the only unconquered dog." 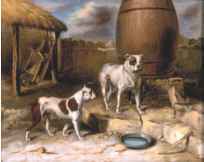 Crib with Rosa, two top British Bulldogs, were painted by Abraham Cooper in 1817. Dogfighting was so widely accepted in America that in 1881, when a fight was held in Louisville, Kentucky, between the famed British imports Lloyd's Pilot, owned by "Cockney Charlie" Lloyd, and Crib, owned by Louis Kreiger, the Ohio and Mississippi Railroad advertised special excursion fares to the big battle. Upon arrival in Louisville, bettors and spectators were taken to a fine hotel, where they were warmly welcomed by the president of the Louisville board of aldermen, the police chief, and other local officials. The referee for the fight was William Harding, sports editor of The Police Gazette, and owner-publisher Richard K. Fox served as stakeholder. Pilot and Crib each weighed in at just under twenty-eight pounds and thrilled the spectators by fighting gamely for an hour and twenty-five minutes before Pilot won the victory. Lloyd imported other dogs who gained fame fighting in America and were also used for breeding. Among them were Lloyd's Paddy, Pat, and Rafferty. In fact, some of today's American Pit Bull Terrier owners can still trace their dog's ancestors back to several strains of superior fighting dogs who arrived in America during the 1800s. A few of these strains are Corvino, Delihant, Farmer, Feeley, and Tudor from Britain; and Colby, Corcoran, Gas House, Lightner, Noonan, and Semmes from Ireland. The designation "Old Family," still in use today, refers to the Irish dogs. Americans who imported them continued breeding them for the same purpose. What Is a Breed Club? Breed clubs are made up of enthusiasts who all enjoy the same breed of dog. These groups may be informal, with people in the same local meeting for picnics, dog walks, or seminars; or they may be more formally recognized, even incorporated. The clubs usually promote the breed, sharing information about physical conformation, temperament, training, health issues, and sports. With APBTs, most clubs are also involved with legal issues, especially breed specific legislation that can potentially threaten the continued existence of the breed. The United Kennel Club and the American Dog Breeders Association are breed registries. (The American Kennel Club does not register APBTs.) Their main function is to record the pedigrees of dogs of the breeds they recognize. Proof of registration is a guarantee that a dog is purebred, but it is absolutely not a guarantee of the quality of the dog. forty to sixty-five pounds. What happened? Pilot and Crib were at fighting weight, but though they would normally have weighed several pounds more, it would not have been nearly enough to make up the difference. One explanation is that because Americans always seem to believe bigger is better, they selected bigger dogs for breeding and thereby created a larger animal. Although this is partly correct, there is more to the story. It is believed that the breed's general usefulness on the frontier was a factor in increasing its size. The American pioneers discovered the Bull-and-Terrier's versatility, bravery, and devotion, and soon the dogs traveled west, becoming indispensable members of many ranch and farm families. The dogs were well suited to life on the frontier, and they guarded homesteads and children with confidence and authority. Many of them also helped round up livestock. The APBT's versatility and strength made her a great all-around farm dog. mountain lions and ravaging wolves. Consequently, when selecting breeding partners for their dogs, they chose larger specimens. Every dog has her day, and the Pit Bull certainly did. Her day was just before and during World War I, when she was so highly regarded that she represented the United States on a World War I poster depicting each of the Allied forces as a gallant dog native to her country. During that time, many issues of Life magazine featured political cartoons with Pit Bulls as the main characters. Pit Bulls even graced the cover of Life on February 4, 1915, and March 24, 1917. The first picture, captioned "The Morning After," showed a bandaged and scarred Pit Bull; the later one, captioned "After Six," displayed a gentlemanly Pit Bull in a bow tie and top hat. Both were drawn by Will Rannells. 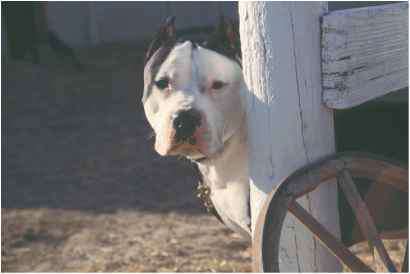 The first Pit Bull movie star was whelped on September 6, 1929. Pete, a brindle-and-white bred by A. A. Keller, achieved fame on stage and screen as the dog actor in the Little Rascals and the Our Gang comedy series. Owned and trained by Harry Lucenay, Pete's UKC-registered name was Lucenay's Peter. During World War I, the breed proved deserving of her country's esteem. A Pit Bull named Stubby was the war's most outstanding canine soldier. He earned the rank of sergeant, was mentioned in official dispatches, and earned two medals: one for warning of a gas attack and the other for holding a German spy at Chemin des Dames until American soldiers arrived. Following the war, the Pit Bull's popularity continued to grow. Depending on what she was used for and where she lived, the breed was still known by many different names, including Bulldog, American Bull Terrier, Brindle Bull Dog, Yankee Terrier, Pit Dog, and, of course, American Pit Bull Terrier. As the years went by, pockets of underground dogfighting activity continued in the United States. By the late 1960s, some dog lovers were determined to put a stop to it, and in 1970 the American Dog Owner's Association (ADOA) was established with the goal of terminating dogfighting. Distorted news stories about the APBT and exploitation of the breed by uncaring owners have given these dogs a bad name. bloodied, exhausted dogs picked up during police raids, instead of on the people who placed those dogs in the fighting pit and wagered on the outcome. A media monster was born, and its name was Pit Bull. The distorted headlines and television stories about the Pit Bull attracted the type of people who weren't going to do the breed any good. When the media manufactured a "bad dog" monster, young toughs—those who revel in flaunting their badness—believed that swaggering through their turf with a Pit Bull by their side would enhance their image. When thugs heard stories about teeth that locked and incredible jaw pressure, they not only believed them, but exaggerated them when they bragged. Soon drug dealers, gang members, and other hoodlums all wanted Pit Bulls. The media myths about Pit Bulls have been discredited, but the punks read headlines, not academic reports. Thus, the same breed of dog that laid her life on the line for her dogfighter owners became the preferred mascot of minor mobsters. It didn't remain the same breed of dog for long. While the dogfighters, like the bullbaiters before them, never wanted and never bred a dog who was aggressive toward people, the thugs had something else in mind. With no knowledge of genetics or dog breeding, they indiscriminately mated their dogs to larger and nastier dogs of any breed. The result was mixed-breed dogs that the punks still proudly and defiantly called Pit Bulls. They used them to terrorize their enemies, guard drug caches, and slow down the police during drug raids. These dogs, now mixed with Rottweilers, various shepherds, and mean mongrels, are no more American Pit Bull Terriers than puppies from a Border Collie-Labrador Retriever cross are still Border Collies. But the press, and sometimes the courts, still persist in lumping together the mobster's mongrels with carefully bred, registered dogs. • Ontario, Canada, March 9, 2005, Public Safety Related to Dogs Statute Law Amendment Act. 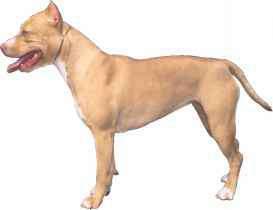 The new legislation came into effect on August 29, 2005, banning Pit Bulls and their importation into Ontario. The new law also places restrictions on existing Pit Bulls; those already legally residing in the province before the date the law comes into force may remain legally in Ontario, subject to certain conditions, such as compliance with leash, muzzle, and sterilization requirements. • Denver, Colorado, April 8, 2005. The Denver District court upheld the constitutionality of Denver's ordinance that prohibits Pit Bulls in the city and county of Denver. The law prohibits any person from owning, possessing, keeping, exercising, or selling a Pit Bull in the city and county of Denver. Pit Bull owners were given thirty days to remove their dogs. The original ban went into effect in 1991 but was challenged in 2004. • Belgium has banned not only Pit Bulls but American Staffordshire Terriers, Staffordshire Bull Terriers, and Bull Terriers, as well as Rottweilers, Rhodesian Ridgebacks, and Akitas. Breed-specific legislation has been passed and enacted, or has been proposed and not yet defeated, in Australia, Britain, Finland, Denmark, Holland, Puerto Rico, Bahamas, and in many states across the United States, including Missouri, Ohio, Rhode Island, Washington, Texas, Washington, D.C., and more. Breed discrimination has also occurred in other ways. Some dog trainers will not allow Pit Bull—type dogs of any kind in a group training class, and some self-serve dog wash businesses exclude Pit Bull—type dogs. Several homeowners insurance companies will not insure a home with a Pit Bull—type dog (or an Akita, Rottweiler, or Chow Chow). Obviously, breed-specific discrimination and legislation is not fair. First of all, how is a breed to be identified, especially something as generic as "Pit Bull?" 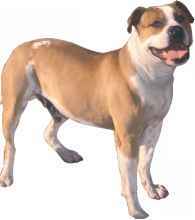 Even the owners of many bull breeds have a hard time telling an APBT, a Staffordshire Terrier, and a Staffordshire Bull Terrier apart. When so many dogs may also be mixes, that just makes things more difficult. If a Pit Bull is illegal, is a Pit Bull-Poodle mix illegal, too? Breed-specific legislation punishes the breed (or breeds), when in reality the owner is the one who should be held responsible. Not all dogs of any breed are "bad" or dangerous. An irresponsible owner can create a dangerous dog of any breed, though. Many communities have also found that when a specific breed is banned, the thugs—owners who want a dangerous dog—simply turn to another breed that has not yet been banned. Unfortunately as long as people own dogs, there will be conflicts between dogs and people. Some arise between neighbors (perhaps a dog is barking too much), while others may arise because some dog owners are not responsible. However, conflicts can be kept to a minimum. APBTs have been victims of breed discrimination, blaming an entire breed for the bad acts ofa few dogs owned by callous dog owners. 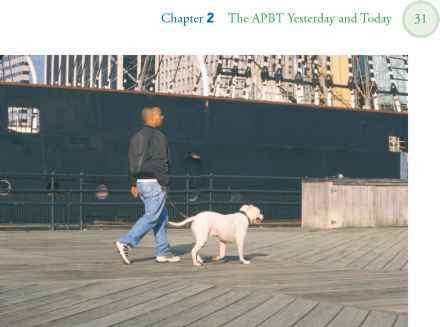 In fact, most APBTs are owned by caring, committed people who socialize and train their dogs to be great pets. Dog-bite prevention programs in day care centers and schools have been very effective and popular. 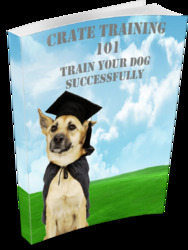 Many dog clubs offer these, and the American Kennel Club has a free education program created for elementary school children. The Foundation for Pet Provided Therapy has a dog bite prevention program called WAGS that visits schools and day-care centers all across the United States. Owners should be held responsible for the actions of their dogs. If a dog is running loose, the owner should be responsible. If the dog attacks another dog, the owner should be responsible. If a dog attacks a person, the owner should be responsible. When legislation addresses the specific problem of an out-of-control dog owned by an irresponsible individual, it is much fairer to all involved. The working instincts of APBTs can be channeled into agility, weight pulling, and many other canine sports. across the United States and has even gone to court to fight for dog owners' rights. For more information, go to www.adoa.org. The real American Pit Bull Terrier, the one registered with the UKC or the ADBA, is the same affectionate, reliable, hard-working, people-loving dog she always was. 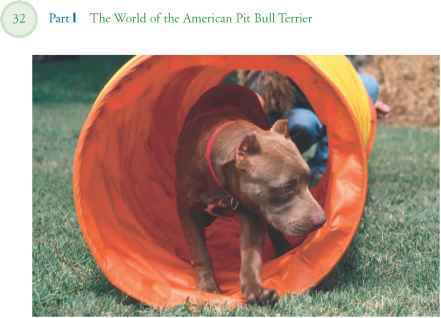 A multitalented companion, the well-trained APBT is suited for a variety of exciting activities. She excels at obedience, agility, and weight-pulling competitions—events that showcase intelligence, trainability, and strength. Today, because dog shows emphasize balanced structure and fluid movement and obedience competition emphasizes trainability, the Pit Bull is sometimes an even more attractive companion then she used to be. In addition, the breed still functions as a farm dog in rural America. The Pit Bull began her ranch work on the homesteads of frontier America and is still depended on for varmit control, rounding up livestock, and sometimes even stopping and holding an angry steer. 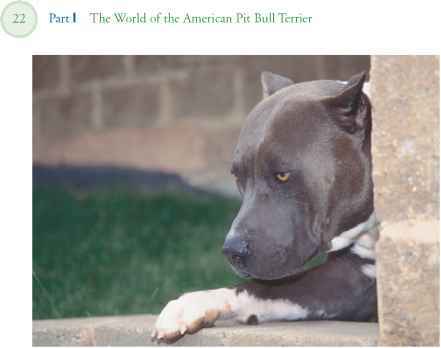 The American Pit Bull Terrier has always been a dog with a strong desire to please her owner. When that owner wanted her to fight, no matter how overmatched the dog was, the Pit Bull fought gamely. And today, when an enlightened owner raises her to be a happy, dependable family companion, that is exactly what she becomes. No dog does it better. What issues of life magazine were pit bulls in? What animal did the first americans hunted?